I got to be a tester for another one of Caroline’s patterns: the Waterfall Tank. (releasing Monday!) This was my first time using rayon challis and I think I might be hooked. It has such a great drape to it- perfect for garments. It is a bit fiddly to sew with so you have to be careful when you cut it out but other than that, its not too bad. I got this particular rayon challis at Wanderlust Fabrics (out of stock right now 😦 ). I just recently discovered them and highly recommend them as a good resource for knits and rayon fabrics. The quality is great, and they will even send you samples upon request so you can see the fabrics before you buy. I got two other knit fabrics with my order and am looking forward to putting them to good use in the near future. Anywho back to the tank pattern. This is a fun pattern to make. I love how easily the ruffle comes together and how you can have so many different options if you using contrasting/coordinating fabrics for the ruffle/main/bias tape. As far at the pattern instructions. It’s a fairly straightforward pattern and I think that you will find it easy to navigate especially if you have any quilting experience. The straps are put together daily similar to quilt binding. Caroline also includes instructions for French seams on the sides and I can’t believe how easy they were and how nicely they finish off the sides. Make sure you make a muslin first though if you are going to do the French seams because it is really hard to adjust the fit after sewing them! My only issue with this tank was that mine turned out too big. I measured into the size L based on bust measurements but should have made the M. I was at the bottom end of the L range so I rounded up to that size but with this top, I would definitely recommend going with the smaller size if you are in between size ranges. I ended up taking in the sides 1/2″ each side and then it fit perfectly. It’s such a great flowy top for the summer! And I like how I could customize the strap length to make it modest up top! 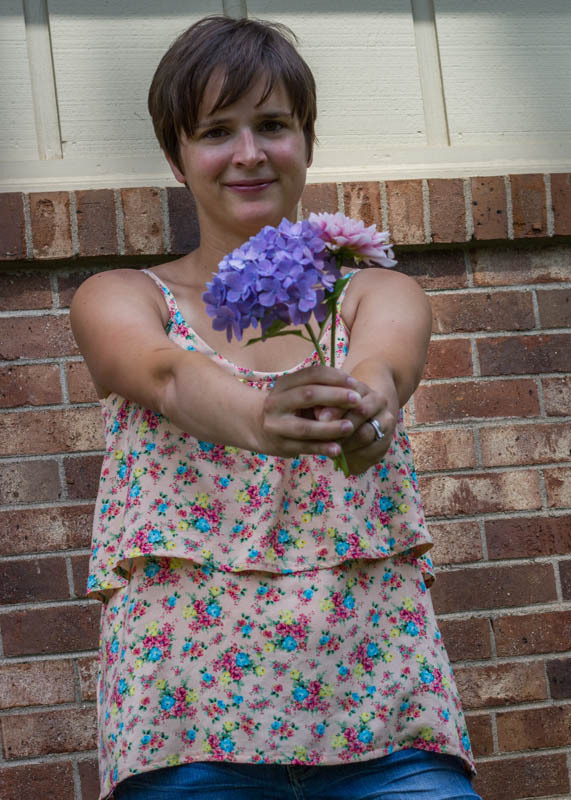 Also check out my cheesy photos…trying out some flower props for something different. Silly, I know, but I’m just loving my hydrangeas and use them for decor any chance I get. My new remote makes it easy for me to cheese it up since I’m by myself (well except for the little photo bombers) but my tripod is still in the mail so it was a little more difficult to set up my shoot location than it will be once I can put the camera on that. 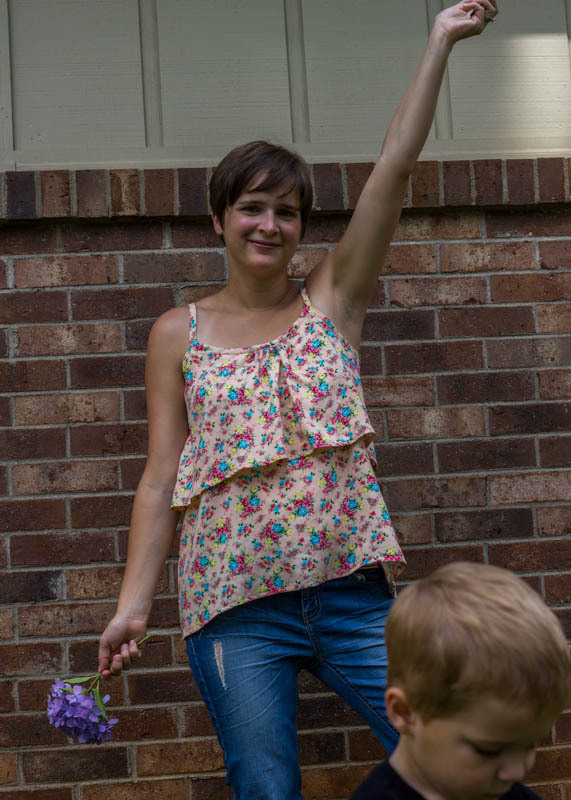 This entry was posted in Selfish Sewing and tagged rayon challis, sew caroline, wanderlust fabrics, waterfall tank by oliver's fancy. Bookmark the permalink. 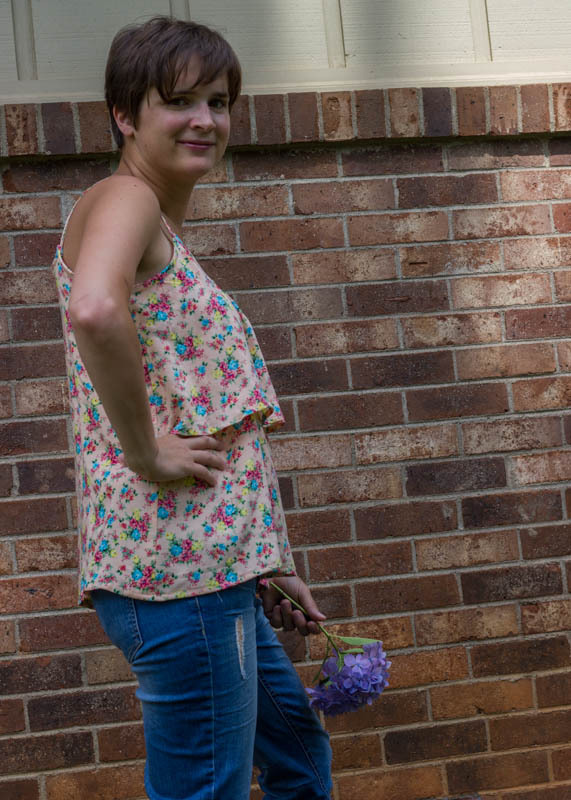 I adore rayon challis and this floral print is so pretty! So cute. And I love French seams–need to use them more often! Purple hydrangeas were my wedding bouquet, and I still love them but I have zero shade in my yard so can’t grow them. Oh how sad about the hydrangeas! We have one very shady spot in our back yard where they grow so well…I get so happy when it’s blooming time.